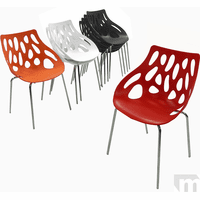 Our LavaFlow Stacking Chair is a fresh, bold redesign of the typical boring stack chair. 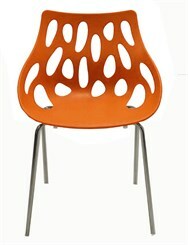 Works great as a compact stackable chair or an attractive and extremely affordable guest chair. 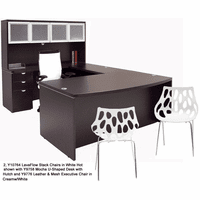 Even works well in your guest/reception area with its no maintenance, easy care construction. Available in White Hot, Orange Burst, Black Obsidian and Fire Red. 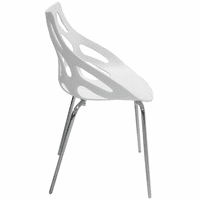 Users will find the molded polypropylene oval shell has just a bit of flex to seat you in surprising comfort for a nonpadded chair. Ideal for low maintenance seating - just wipe down with a damp cloth. Chromed steel tube legs are strong and durable. Oval cutouts incorporated into design of shell serve as handles making stacking a breeze. Stackable up to 5 chairs high. SOLD IN MULTIPLES OF 4 ONLY! PRICE IS PER CHAIR. Measures 23"W x 20-1/4"D x 33"H overall. Seat height is 18"H. Shipping weight 46 lbs./carton of four. Legs detached for safety in transit. All components exceed ANSI/BIFMA commercial use requirements. 5-Year Limited Warranty. Ships unassembled. PRICE INCLUDES SHIPPING! IN STOCK!